Over the past few years, soccer-playing humanoid robots have advanced significantly. Elementary skills, such as bipedal walking, visual perception, and collision avoidance have matured enough to allow for dynamic and exciting games. When two robots are fighting for the ball, they frequently push each other and balance recovery becomes crucial. In this paper, we report on insights we gained from systematic push experiments performed on a bipedal model and outline an online learning method we used to improve its push-recovery capabilities. 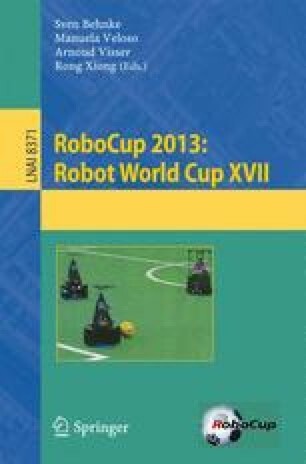 In addition, we describe how the localization ambiguity introduced by the uniform goal color was resolved and report on the results of the RoboCup 2013 competition.